For the boxer and actor, see Randall "Tex" Cobb. Randall Ladonald Cobb II (born August 22, 1990) is an American football wide receiver for the Green Bay Packers of the National Football League (NFL). He played college football at Kentucky. Cobb was drafted by the Packers in the second round of the 2011 NFL Draft. Cobb was born to Randall Cobb Sr. and Tina Cobb. Randall Sr. worked at the Denso car parts factory in Maryville, Tennessee and also worked side jobs in the evenings, ranging from installing ceramic tile floors to mowing lawns and plowing snow, with young Randall helping. Tina, who was a track star in high school, later worked at Denso, where she met Randall Sr.
Cobb attended Alcoa High School in Alcoa, Tennessee, where he was a letterman in football, basketball and track. His football team was a four-time State Champion in Class AA and Cobb received a "Mr. Football" trophy from the Tennessee Secondary School Athletic Association. At that time he played both offense and defense as well as special teams, but made his biggest impact as quarterback for the Tornadoes. He was an All-district basketball player as a junior. Cobb played collegiately at the University of Kentucky. During his freshman year he was named to the SEC All-Freshmen team at quarterback, playing in 11 games and starting four at quarterback. He accounted for 11 touchdowns as a freshman—two passing, two receiving, and seven rushing. In his sophomore season, he played mainly wide receiver as well as a significant role in the offense/special teams returning kicks, place kick holding, receiving, and also quarterback in the "Wildcat" formation. He scored 15 touchdowns—four receiving, one returning, and 10 rushing during the 2009 season. In his junior season, Cobb scored a touchdown on a punt return against Western Kentucky. Head coach Joker Phillips said, "He's one of the best leaders I've ever been around." On October 9, 2010, Cobb scored four touchdowns against undefeated Auburn, tying the Kentucky school record for career touchdowns at 32. He was also the first player to score a rushing, passing, and receiving touchdown in the same game for Kentucky since Shane Boyd in 2003. Cobb majored in Community Communications and Leadership Development. Cobb was drafted in the second round (64th overall) of the 2011 NFL Draft by the Green Bay Packers. 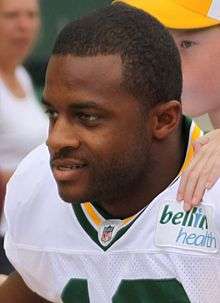 On September 8, 2011, in the Packers' opening game of the season against the New Orleans Saints, Cobb became the first person born in the 1990s to play in the NFL. Cobb recorded his first NFL touchdown on a 32-yard reception in the first quarter, and followed up with a 108-yard kickoff return in the third quarter that tied the record set by Ellis Hobbs of the New England Patriots in 2007 for longest kickoff return in NFL history. It was later named Play of the Year at the season-ending NFL Honors banquet. In a Monday night game against the Minnesota Vikings on November 14, Cobb scored his second special teams touchdown of the year on an 80-yard punt return in the first quarter. With that, Cobb became the first rookie in Packers history to return both a kick and a punt for a touchdown in the same season. For the season, he caught 25 passes for 375 yards (a 15.0 average) and one touchdown. His most impressive stats were on special teams, as he returned 34 kicks for 941 yards (a 27.7 average) and one touchdown and 26 punt returns for 295 yards (an 11.3 average) and one touchdown. In 2012, Cobb played in 15 games including eight starts. He led the team in receptions with 80 and receiving yards with 954 and was second on the team with eight touchdowns. He set a Packers single-season record with 2,342 combined net yards—954 receiving, 132 rushing, 964 on kickoff returns (a 25.4 average) and 292 on punt returns (a 9.4 average) including one touchdown. He also led the NFL in that category. He was named a Pro Bowl first alternate as a kick returner. In 2013, he was limited to six games (including four starts) due to a broken fibula injury suffered in Week 6 against the Baltimore Ravens. Up until his injury, which kept him on the sidelines until the season's final game, he led the Packers with 29 receptions and was second in receiving yards with 378. He also rushed four times for 78 yards, a 19.5 average. He returned to play in the regular season-ending game and caught a memorable 48-yard game-winning touchdown pass from Aaron Rodgers to win the NFC North title for the Packers. Cobb was on pace for personal bests through the first 10 games of the 2014 season, with 54 receptions for 779 yards (a 14.4 average) and an already career-high (and league-leading) 10 touchdown receptions from Aaron Rodgers, including at least one touchdown in eight of 10 games. In the Packers' 10th game, he had personal season bests of 10 receptions for 129 yards. On January 19, Cobb was named as a replacement for Dez Bryant in the 2014 Pro Bowl. He was ranked 100 on the NFL Top 100 Players of 2014. On March 7, 2015, Cobb signed a four-year, $40 million contract with $17 million guaranteed to stay with the Packers. After signing the deal, Cobb explained his thought process. "At the end of the day, my heart was in Green Bay, and I knew that's where I wanted to be. I knew I had a good thing going for me, and still I signed a pretty lucrative deal that I can handle as far as making that last for the rest of my life." Cobb also mentioned that the NFC Championship loss to the Seahawks still bothered him. "Obviously, that loss still hurts. It still feels fresh. I want to win a championship, and we were right there. We were close. We didn't do what we needed to do to win, but we have a lot of the guys coming back this year, same guys. A lot of our core guys, and we believe that puts us in the mix. So we have to handle business this offseason as far as continuing to get better on a daily basis. Obviously, next season, we have to put ourselves in position to go on a run." In 2015, Cobb had one of his worst seasons as teammate Jordy Nelson went down with an ACL, posting only 6 touchdowns. On December 3, during the Miracle win, Cobb recovered a James Starks fumble to give the Packers their first touchdown of the game 7-20. The Pack would win 27-23 after a Rodgers to Rodgers Hail Mary. On September 16, 2016, Cobb was fined $9,115 for pulling the face mask of Paul Posluszny in Week 1 against the Jacksonville Jaguars. Second-longest kickoff return touchdown: 108 yards (2011) (tied with Ellis Hobbs, Jacoby Jones and Knile Davis). ↑ "Green Bay Packers: Randall Cobb". www.packers.com. Retrieved 2015-11-14. ↑ Nickel, Lori (April 29, 2011). "Packers Like Cobb's Versatility". Milwaukee Journal Sentinel. Retrieved April 30, 2011. ↑ "Randall Cobb becomes first NFL player born in 1990s". Pro Football Talk. September 9, 2011. Retrieved 9 September 2011. ↑ Rosenthal, Gregg (March 7, 2015). "Randall Cobb, Packers agree to four-year, $40M deal". NFL.com. Retrieved 2015-03-07. ↑ Jones, Brian. "Report: Randall Cobb fined by NFL for penalty against Jaguars". 247 Sports. Retrieved September 16, 2016. ↑ "Randall Cobb Stats". pro-football-reference.com. Retrieved 29 January 2014. 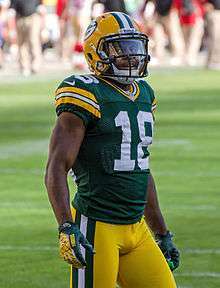 Wikimedia Commons has media related to Randall Cobb (American football).